Harriet's Hedgehog Blog: Sea Hedgehogs? Did you know the word urchin means hedgehog? So a sea urchin is a sea hedgehog. 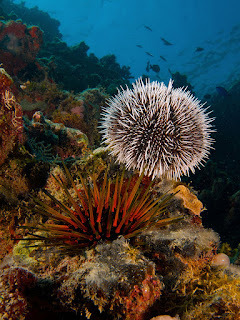 Click here to learn more about the word urchin. Harriet, I had no idea sea urchins and hedgehogs were related, if only etymologically. Hope I spelled that word properly! Your dictionary is very interesting too. I'll be checking it again when need arises. And that's a lovely picture you posted above. I'm glad you haven't lost your interest in hedgehogs. They are delightful animals.